My friends and I were nattering nineteen to the dozen over supper, catching up on news and gossip when Emily suddenly turned to me and said, poker face “I’ve a new man in my life.” I looked questioningly at her, surprised, and then across at Geoff, leaning back in his chair thoughtfully twirling a glass of wine. “Yes. I hardly see her anymore” he confirmed. Passing the simple, yet quite beautiful church I turned down on to the Marsh and before long was knocking on the door of Bob’s farmhouse. I spent an afternoon that I hope will live forever in my memory. We walked across the open landscape of the Marsh and as Bob pointed out the cast-up field systems cultivated in Romans times we discussed the virtues of farming ancient and modern. 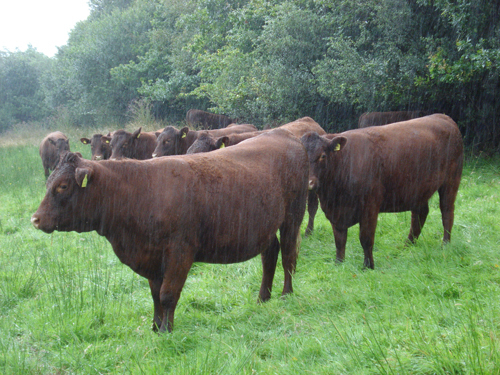 The Romney or ‘Kent’ sheep and red Sussex cattle used to graze the acres of his farm – now no longer pure bred the sheep are crossed with Charolais and the Sussex with Aberdeen Angus. I point out the mile-upon-mile of cleft chestnut fencing and intricate sheep handling pens…Bob it transpires, made them all. In Bob’s youth cattle from hop farms used to graze the marsh during summer months…returning home in winter to be housed in yards; the muck they produced was valuable and much-needed for the hop gardens. 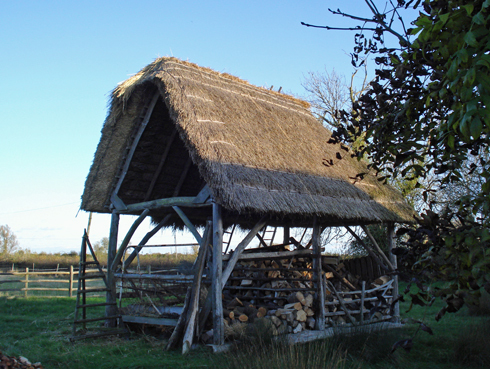 We cross back over to his farmyard where he shows me his chestnut wood store, his threshing machine, his thatching frames used for teaching apprentices, and yes, even his workshop! Twenty five years ago Bob handed the farm over to his sons and took up long straw thatching, a very different method to our West Country thatch. 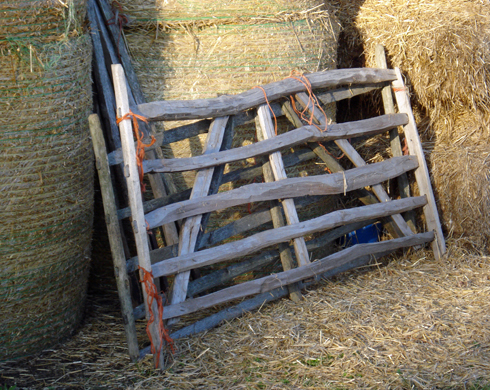 Around the yard I notice all the bullock handling systems, gates and crushes are made from sturdy cleft chestnut…I’m amazed, thrilled (I hate the feel of metal) and, Bob assures me, they are strong and safe, never causing injury to an animal or handler. We continue, talking non stop. Crossing into his garden, we pass beautifully laid out vegetable beds lined with dahlias and walk along cinder paths past an ancient orchard still used to produce cider. Turning a corner, I was stunned by the sight of a perfect tiny cottage. “Ah, yes” says Bob modestly but with a twinkle in his eye “I wanted to see if I could build a framed building as they used to. 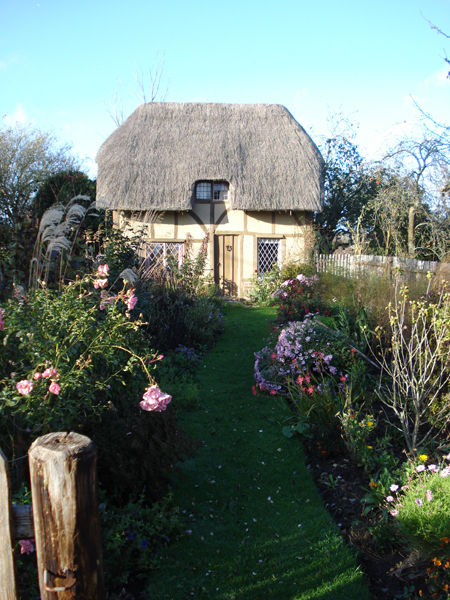 Completely out of cleft and pegged oak …thatched. So I decided to make it for my grandchildren.” I’ve never wanted to return to my childhood more than at that moment…and to be one of Bob’s descendents! Inside was just as enchanting…a kitchen, a sitting room, dining room and an upstairs with two wee bedrooms! All the furniture Bob had made out of the elm from the farm. I left with the sun sinking below the marsh, leaving a silhouette of gnarled trees filigreed against the skyline. As I nibbled on a walnut from the farm’s ancient orchard, I knew, with certainty, I would return. I lifted her warm sleepy-damp, mouse-scented body out of the cot and into our bed. “S’okay” I mumbled from under the giggling bunny jumping bundle. But he was right, not a wink more sleep was to be had. So dawned the Wedding Day. Bright, breezy and much fresher. Now we had expanded into the main house there was the option of breakfast. I declined; I would take Camille down to the apartment. And after the wee set-to of the previous evening my feathers were still somewhat ruffled. However Robert, all shiny English brightness, walked into the salle a manger with a smiling Bonjour only to be met with glacial stares from three formidable middle-aged French spinsters and a grimace from a sour looking couple with a young child and baby. So! Monsieur had been between a rock and a hard place when his temper got the better of him the night before, had he? Not excuse enough! Madam, however, did appear quite desolait when she understood the extent of Monsieur’s unreasonable behaviour. We put it down to lack of communication. The morning was taken up with entertaining/containing over-excited children, last minute arrangements and the arrival of more guests; also the cleaning and decorating of cars with ribbons and the perfecting of our wedding clothes. The bride, who was not allowed to meet with her groom or daughter, popped in before her hair do and later on to collect her dress which I had hidden in our room…unbeknown to the bridegroom. After a hasty lunch a tired, nervous groom and whizzing daughter retired to our room for a siesta. “It’s alright, s’alright” I soothed. “All the showering and washing was done before they went to sleep. It’ll be fine, I’m sure I’ll be ready in time.” With that Ben appeared. I turned to him “Oh hi! Did you manage to sleep a bit?” I asked. “I’ll wait till Ben’s finished.” He was still visibly tense. 4pm – time to drive to the church of Saint-Pons in Puyloubier, a pretty hill village at the foot of St Victoire. We, in our little hired Citroen, were the designated wedding-mobile for Ben and Camille, and as parking was known to be difficult it was imperative we gave ourselves enough time – after all it’s the bride’s prerogative to be late, not the groom’s party with the feeble excuse of ‘Oh, we couldn’t find a parking space’! All was well. As we walked towards the small treed square in front of the church we could see people already beginning to gather. Having no idea about the etiquette involved in French church weddings I was eager to see inside the church and meet the priest. The crowd outside the church swelled. Friends and relatives, French and English. They all clamoured and swirled around us in a multi-shifting kaleidoscope of confused colour, movement and noise. Pip and I escaped into the cool white interior of the church where an unusually beautiful young man came forward to greet us. “Ah bonjour Benjamin, bonjour. Ce va?” he said warmly clasping Pip’s hand and looking at me questioningly. We were then given a little rehearsal about the coming in, the whys and wherefores, the dos and don’ts. It transpired that after the congregation were seated, first to enter the church arm-in-arm were Benjamin and me, then the four bestmen and four bridesmaids and finally the bride and her father. I also learnt mine was the first reading almost kicking off the service! Nerves were beginning to jangle; I hadn’t expected high profile…luckily the charming priest promised to prompt when necessary. With astonishing rapidity it was time, we were on! Down the aisle we walked; what memories, what feelings, more nervous than at my own wedding. The congregation were clapping, calling out, craning their necks while a bank of flashes whizzed and popped around us like exploding fireworks. Having left Pip at the alter I blindly walked to our pew and felt Robert’s reassuring hand “You look beautiful, so beautiful” he murmured. I sunk into him. The music changed and there, glowing in a sheath of soft white wild silk, was Berengere and her father Roland. The rest of the service passed in a dream of readings, responses, music; Theo, Camille and her adorable cousins playing up and down the aisle, amongst the congregation and around the bridal couple; an unforgettable moment when Theo, the ring bearer, turned to the congregation and with both rings pushed loosely onto his fingers said solemnly “Look! Very ‘portant work. I’m very, very ‘portant.’ And sharply exited right! So it’s only now as I come to write this that I have read and taken in the order of service! Suddenly it was all over. There we were outside the church throwing lavender (from Provence) and rose petals (from Locks Park) over the happy couple. Photos, chatter, excitement and bon viveur and we were on our way, with an excited, but fairly tired Camille, to the Bastide De Puget for the reception. I stood by a table covered in name tags, hundreds of them. People were being greeted, ticked off the list and handed a tag. My eyes flicked from face to name and back to face. Did I know them? Was this beautiful well-groomed woman the little girl I played with on the climbing frame, all grazed knees and scraped elbows? And could that possibly be the frustratingly cocky boy I desperately wanted to beat in the under fives swimming heats and never could; now overweight, purple faced and sweating? I felt surreal. A cine film of my early childhood was flickering disjointedly through my head. I jumped as someone screeched and threw their arms around me. “Sorry, no I wasn’t. It must have been a different me. But maybe…” I trailed off, her attention was already elsewhere “DAHling…dahling…” she shrieked as she bore down on another unsuspecting body. The throng grew and throbbed. I went back to looking at the arrivals and turned to one of the organisers. One of the few positive things about a parent dying is renewed contacts. Having lived and worked abroad my parents and I had large and varied group of friends and acquaintances and some of these old connections were revived when my mother died. So that’s how I came to be at a Hong Kong kids’ reunion in the Royal China Restaurant, Queensway, London. Amanda (my best friend in Hong Kong from the age of four to eight) had been in contact when she heard about my mum’s death. Unable to get to the funeral because of the snow, she suggested I come to the reunion. Not one for reunions I nevertheless decided to go. The circumstances made me nostalgic I guess, and I wanted to see Amanda again. Our mothers had been close friends for many, many years and I had heard snippets of Amanda’s life through their friendship. I hadn’t seen Amanda since I was eight. It was bizarre. Ghost names and echoes of familiar features jostled around me. Of course it was their parents in them I was recognising. It was as if one generation had jumped to the next in an instant. Brain bending, reality contorting. You find yourself double-taking, back-tracking and fast forwarding all at the same time. Every Easter Sunday we hold an egg competition. Will is master egghead who devises new ingenious eggcentric challenges. Over the years we’ve had ‘How to Get an Egg Across a Lake ( using air power)’, ‘Keeping an Egg in the Air the longest’, ‘How Far can you Splatter an Egg’…how to cook an egg, how to dissemble an egg, egg creations, egg songs, egg poetry, egg music. Around fifteen to sixteen years of eggsperiences. This year the challenge was ‘The Most Remarkable Thing You Can Do with an Egg’. Entries were slow starting but by Saturday they were pouring in from across the world. Winner of the World Class. The most remarkable thing Joe and Jess did with an egg! Judging was hard. Bribes of unmentionable proportions were bandied across continents. In the end the judge decided to categorise the entrants (those bribes worked) and was happy to award a first prize to all competitors! Undisputed winner of the Under 10 European Entry - Camille's egg juggling! There are too many to upload. A big thank you to all participants, judges and competition inventors! A few of you have asked if I’m still working at Crede, my friend Pavla’s boutique in Exeter, as I haven’t mentioned it recently. Yesterday I had an email from Mary (thanks) who brought the subject up, prompting this update. Yes, I am still working there in between my farming, business and writing commitments. But since that fateful Black Monday at the beginning of October I have only been helping out occasionally, whenever Pavla has to go away on buying trips. She can no longer afford the luxury of everyday staff. Recession, hype, panic and worldwide financial mayhem has severely affected shopping habits making it a hard and rocky road for retail businesses. 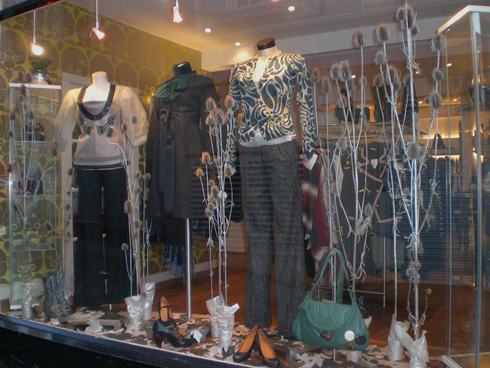 Six independents have gone into liquidation in Exeter in as many months. It’s pretty frightening if you’re a small business out there at the moment. Pavla’s worked hard and relentlessly over the last nine months. As she notes, there are benefits of being an independent in times like these. You have the ability to respond quickly to feedback from customers, and to adapt quickly to changing economic circumstances. Pavla says “I read a lot about ‘credit crunch’ last January and February so adapted my buying accordingly. I sourced a wider range of well priced, interesting everyday items as well as keeping the more unusual investment pieces. “I looked at what overheads to cut, again I have the flexibility to make cutbacks where necessary – but unfortunately that meant Paula’s hours! 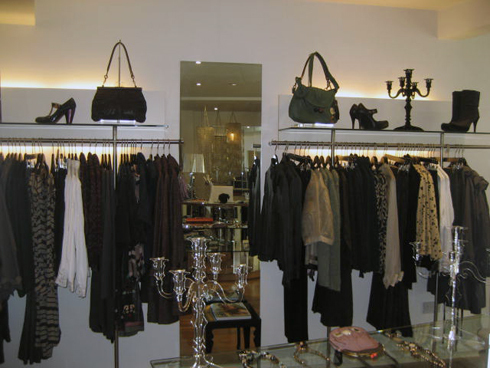 I really miss her contribution to Crede – as someone who has run her own business she understands all about customer service – again something that independents can offer that high street can’t – personal service, as well as an enthusiastic love of clothes! 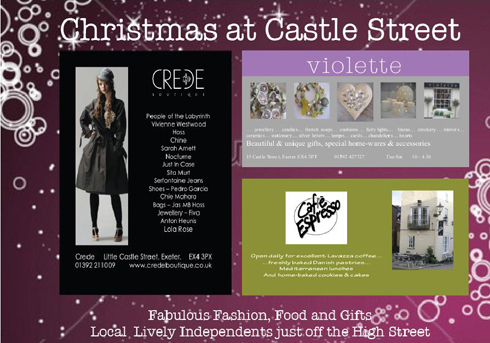 Apart from making the shop a special and enticing place to be in she has joined forces with neighbouring retailers to promote Castle Street as a good shopping area. “We are all independents in this area which despite being very close to High Street some people are still unaware of. Rosie (of Violette) and I worked together on some ideas and have come up with a Christmas leaflet design. We are all contributing to the costs of printing and my mum is doing a leaflet drop in Exeter. Sidestepping the real tasks I clean up my computer; I arrange all my books in alphabetical order. Eventually I make it to the work in hand. I try to call people…planning department, builder, energy consultants (totally useless), soil association (bone to pick), Devon Cattle Breeders (cattle to sell): no one’s there; are they playing the avoidance game too or they are away on holiday? Scuppered; I don’t need much to stop me dead in my tracks today. 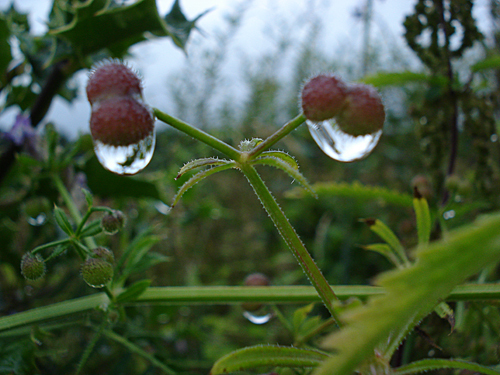 I take the dogs for a walk hoping the pouring rain will refresh enliven and stimulate. 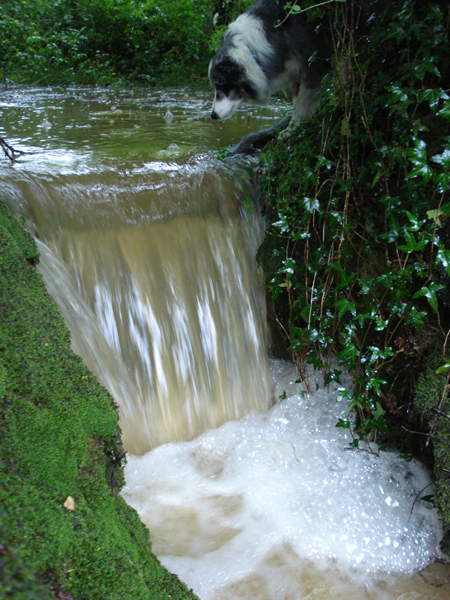 Plish, plash, plosh, splish, splash, splosh – I’m in a world of green wetness. I slip trying to cross the dam to take a photo of the impressive waterfall. My boot fills with cold muddy water. Squelch squash squish – warm spurts are propelled out of my boots. The dogs are intrigued by the noise and pouts of water landing on their noses. After I returned from my wet walk I tried to upload my photos onto my blog, but as yesterday’s luck would have it they refused to upload. After an hour or so fiddling and loosing patience I was rescued – by some good friends. A life saver; wine, nosh, talk and a laugh!